We see a lot of accessories for the Switch here at Nintendo Life, with carry cases, extra peripherals, projectors, and lots more littering online stores around the world. 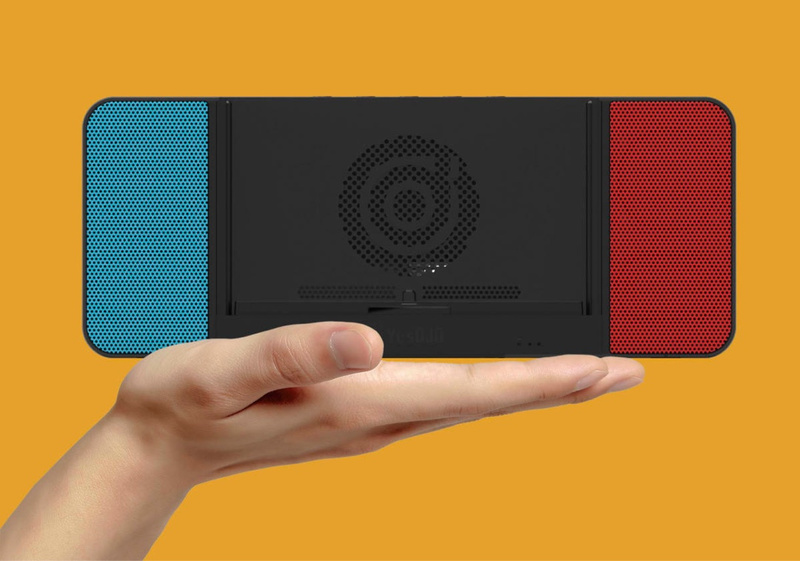 Today, though, gaming device and accessory company YesOJO has unveiled a new portable speaker, something the company says is a "world first". 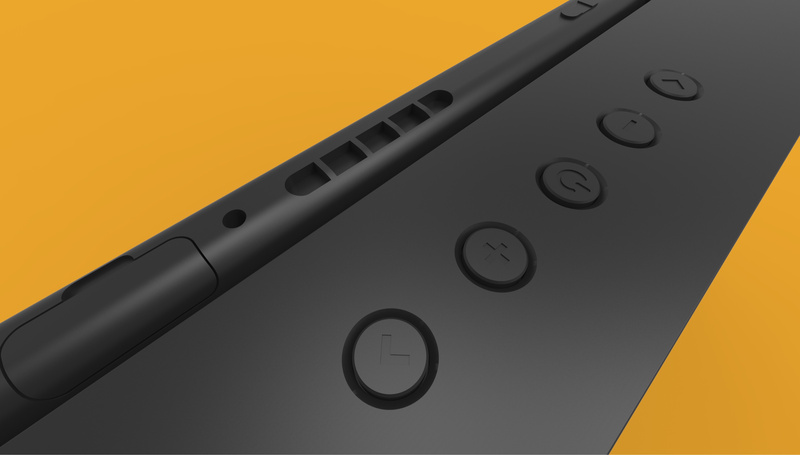 As you can see, the speaker is designed for use with the Switch's tabletop setup exclusively, with the console slotting in without Joy-Con attached. 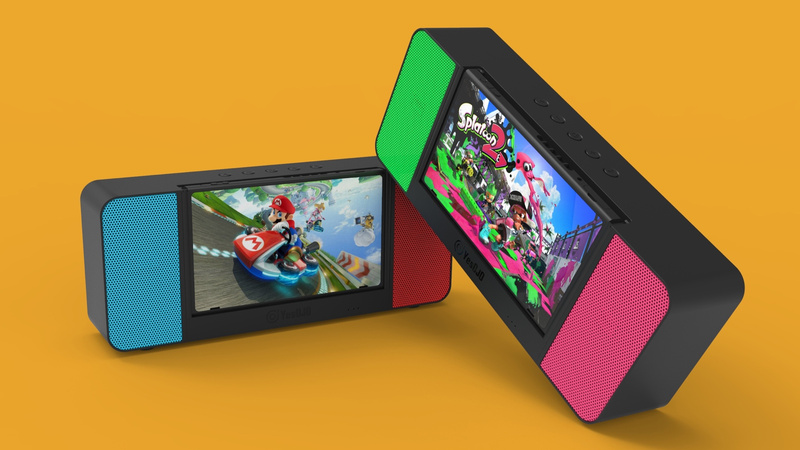 In a lovely touch, the speakers are the same colours as the traditional Joy-Con combinations, meaning you can still play with your favourite colours clearly in sight. The speakers are said to provide "rich audio quality with a deep resounding bass". 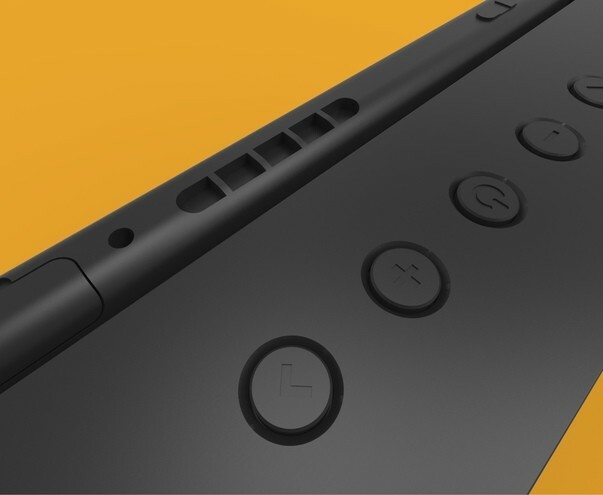 It features an "expert" cooling system for your Switch (more details are expected to be revealed about this soon), allows 8 - 12 hours of playing time from a single charge, and the dock actually charges your Switch when connected to a mains power supply. 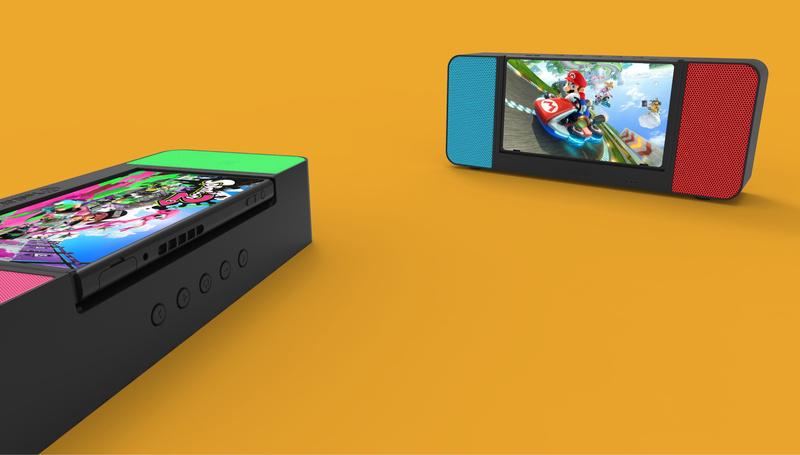 It can also act as a power bank, giving 8 hours' worth of play time or two full charges to the console. Interestingly, the speaker will also support other devices via bluetooth and features 2 USB 3.1 ports for charging other devices, too. If you're interested in buying one for yourself, you'll have to wait a little while, however, as the speaker is set to feature in an Indiegogo crowdfunding campaign in "early 2019". For now, the product has simply been revealed as part of the Tokyo Game Show 2018 celebrations. Let us know what you think. Will you be keeping an eye out for this next year? Do you think this could come in handy for some future tabletop sessions? Because Street Fighter 30th Anniversary on Handheld is ALMOST Too Quiet. I cannot even hear the sound clearly. @Anti-Matter i thought it was just me. @NewAdvent If you look closely to the pic of the back, it appears to have a kickstand! Awesome! It was very Contrary with Sushi Striker. The game had Very LOUD sound on Maximum sound setting, while SF 30th Anniversary was TOO Quiet on Both Handheld and Docked mode. (I still have to increase my TV Volume for SF 30th Anniversary). @Zeta Where do you see a picture of the back? I just see fronts and a top shot. I bought myself a little Rockbox speaker and it's made such a difference to playing in tabletop mode, especially in the wee table top arcade I have. Really adds some much needed oomph. I use it when playing in handheld too but having a wire coming out the top is a little annoying. 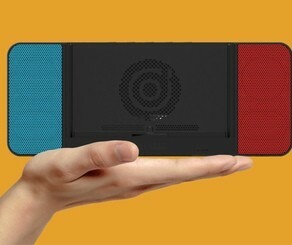 The Rockbox speakers can be had for as little as $15. Sound quality is great for what it is. Highly recommended. @NewAdvent I agree, playing the Switch like that on a table would be a literal pain in the neck. I’ll stick to my current tabletop (or desktop, more appropriately) setup with Bose Companion speakers and an adjustable stand. @HobbitGamer Wow, my first comment ever here and I already messed up. Sorry, I'm at work and mistook the picture of the front for the back. It just had interesting lines that looked like a kickstand. I'm back to only mildly interested. I'd like it more if it worked like a dock, because I don't have much of a sound setup on my TV. I never play in tabletop mode. Then again I could imagine it being nice for Hulu watching while working on the computer if nothing else. @Zeta Haha, I had to do a double-take on that shot, too. I think if I wanted good sound, I'd be using headphones in handheld. I bet this would be nice to use with the music player in smash bros.
For all the rooftop parties. @HobbitGamer I use my switch in docked mode 90% of the time. Unless I want to play after my wife's gone to bed. Then I'll lay down and play Octopath. Is this made by the same people that did that projector dock??? Didn’t that make promises it couldn’t deliver? I think the Genki is a more usable solution. Just bluetooth it to a speaker or headphones. It looks and sounds great on paper, but it looks really bulky and impractical. The sort of unlikely situation where something like this would even be remotely practical would be a situation where there is more than likely to be a TV nearby. So it’s a 3rd party dock/stand that doesn’t have an hdmi output but does have portable speakers. I suddenly want a Switch with an edge-to-edge screen. 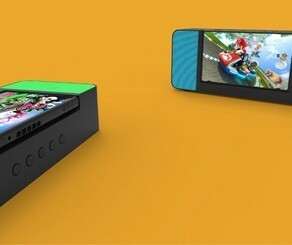 Just curious but would the charging feature cause the Switch to be bricked like those portable docks did? Or, since this isn't technically a dock, would it be safe to use? Kind of reminds me of the Intec loudspeakers I used to have for the GBA SP. Boy, those things were loud! The speakers are said to provide "rich audio quality with a deep resounding bass"
In before it bricks systems. Wait, is that WIRELESS Power A Pro Controller for Nintendo Switch ? We just plug our external speakers into the jack when we use it in tabletop mode. 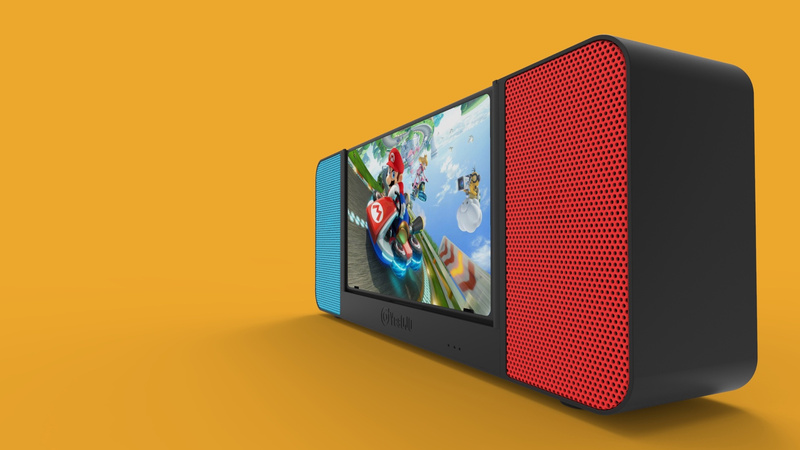 Bluetooth speaker ability for New Switch would be nice though. That's a brilliant idea. I've always thought the speakers in handheld/desktop mode are a little too quiet. Even headphones (the cheap ones I own) don't help. I am a little deaf though so others may not have the same problems. @Anti-Matter Indeed, it’s whisper quiet compared to every other game on Switch. This would be a must buy if the Switch had a web browser. Otherwise it's useless to me cuz I don't really play games in tabletop mode. @Yosheel hey guys, I found Karen. the Sound that the Switch puts out in hand is great as is, so to be of any reasonable value, you would have to place it more than 10', may not seem like much, but when you're trying to lean forward to see finer detail, it defeats the purpose. then, why would you need a boom-box when it (the Switch) has no ability to play MP3's, no YouTube or Netflix service or anything that would warrant some loud speakers for a small screen. now a wireless "Pro-Controller with loud speakers may be interesting, for an enhanced set of stereo when playing on your tv !!! Those speakers look really cool. Could be useful for when hopefully the NETFLIX app appears. Interesting idea... would be nice if it incorporated other features... I will stick with headphones. Can it be angled ? I am not surprised to see this. Some games like Mario Tennis are just super quiet. I was playing in tabletop mode and could barely hear the game. starting to feel like the switch is going back to the days of the Gameboy, next it will have a flip down lens to magnify the screen. Love the people being negative about this that would instantly defend it if it was exactly the same but made by Nintendo. I like this idea, but I do hope the edit an option to tilt it back somewhat. That's all they need to do to make me want this. Nintendo, take note, give us one of these these, made by you, or at least tested by you, that also functions as a portable dock. This would be an awesome idea as a revised dock and I would jump on it if it did that!